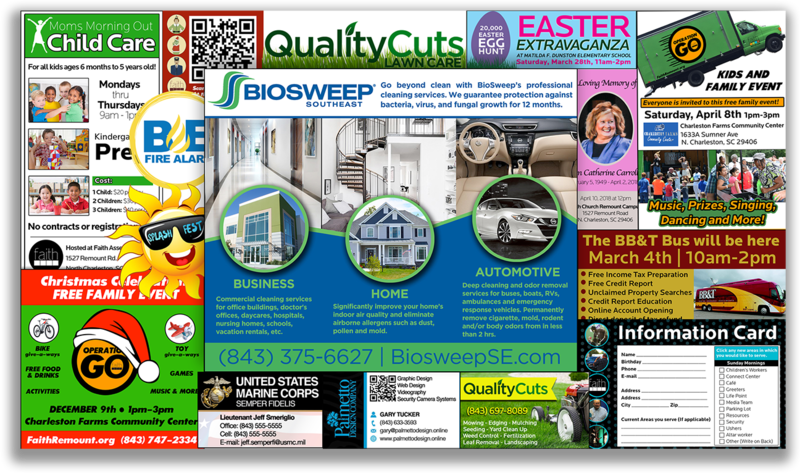 We design and produce a wide range of materials to answer all of your graphic needs: Banners, Brochures, Business Cards, Fliers, Logos, Menus, Magazine Ads, Funeral Programs, Wedding Invitations, and more. Your logo is a visual first impression for your brand and should be seen on all of your advertisement pieces. Let us work with you to create a visually stimulating logo that matches the heartbeat of your organization. High-quality infographics are 30 times more likely to be read than text. We know how to convey ideas and data in the most visually appealing way. Whether it’s for a magazine, trade show, billboard, social media, T-shirt, etc, creative design plays an important role in your advertising strategy. We work hard to create advertisement pieces that stay true to your brand, while attracting new customers. If first impressions are everything, you don’t want to skimp out on business cards and letterheads. Let us design a clean, professional business card and letterhead for you that stays consistent with your branding. Whether you’re making a sales presentation or teaching a seminar, we’ll make your information impactful and visually compelling. From icons to images, we design creative elements that enhance the look of your site. If you need a website or want your current website updated with a fresh new look, we do that too! Whether it’s Apple, Amazon, or even the Dollar Shave Club, there’s something about receiving a package from a company who invests in their package design. Let us design your company’s packaging that makes you stand out from the rest. Details of what kind of graphic design project you have in mind.